Birth Art, Part III…..Ring Slings! Rio is about a month old in this photo. So tiny! So light! I do want to finish the “Birth Art” series, though maybe now it should be labeled “Baby Art.” Rio got so many cool creative gifts, and there’s so many fun things you can make to welcome a new little one. I made this baby ring sling myself, and you can make one for the fraction of what one costs, and only about an hour of time, if you’re already a proficient sewer. It’s a great baby shower gift. We’ve done a lot of baby-wearing with Rio. Right from the start, he loved being snuggled close to mommy, and mommy had to get some work done other than baby-snuggling. Even now, if he’s fed and dry and still fussy, putting him in a front pack of some sort is almost always the answer. We also wear him at the garden, which is quite a workout! We have several different ones. While I wouldn’t recommend a 10 mile hike in the ring sling, it’s great for around the house because it’s so easy on and easy off, and you can take it off and lay him down without waking him up, which isn’t so true of some of the more comfortable but more complicated carriers. Now that he’s bigger, I’m in search of the perfect backpack, preferably one that’s easy for one person to put him into. Suggestions? I got the instructions for making this at the Maya Wrap website. I don’t know why they give instructions on how to make their product at home, but they work pretty well. There are also thorough instructions on there on how to wear your baby in the sling. It’s best to order the rings online at slingrings.com. I prefer the largest size. You can also purchase something similar at horse supply stores, I think they use them as part of the bridle on horses, but they tend to be heavier. It’s best to select a medium-weight woven fabric that looks the same on front and back, since you’ll be able to see both sides of the fabric. Other variations I’ve seen are to add a pocket to the extra fabric in front, and to stuff a hem along the edge of the carrier to make a long narrow pillow to support baby’s head. Tags: baby shower gifts, baby wearing, how to make a baby ring sling. Bookmark the permalink. HI Katie! Very cute!! And a nice idea to use fabrics you have & like already. 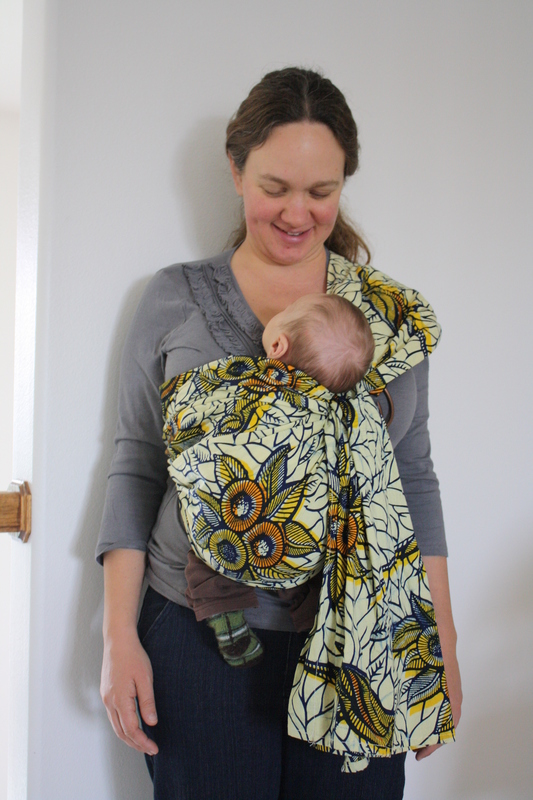 For next stage, everyone I know recommends the Ergo, for baby to toddler ages (everything except newborn). Not the cheapest baby item, but you can use it for years. Some people like the external frame backpack carriers for longer hiking. For slightly pre-Ergo, we are enjoying the Baby Bjorn carreir, primarily because Chris doesn’t feel like he is crushing the baby (as he does in all the sling-like carriers) since the straps attach to the body, then the carrier on the front. It also wear and possible to unclip and lay the baby down. It works for supporting their head when they’re really little and then you fold that part down and can have them facing out once they can support their head. We hated the beco butterfly! Nathan cried and so did I after only one day walking around Frankfurt. It was so uncomfortable despite its outrageous price. We love our Deuter kid comfort 2! I tried on at least 8 packs. I highly recommend doing so. This was by far the one that fit me best. Take Rio and try them out. It is a big investment but would be a great Christmas gift for both of you. I have friends who swear by the ergo. I want to try it. The various bjorns are all different too. I upgraded to the lumbar support one and can’t imagine how I ever used the original now. I love back support. Give rio kisses from us! I’m still sending you the Moby….totally the best for newborns. Sorry I haven’t gotten it there yet, crazy week at work last week but should be able to get to the post office tomorrow. we have a new Ergo which Rio doesn’t totally love. I’m trying to get him (and me) used to the backpack position and I don’t really feel like he’s big enough for a frame pack. We have a group here called Treasure Valley Babywearing that owns lots of packs you can try at their meetings, but the meet on Saturday morning and I often work the farmers’ market then, so haven’t made it to a meeting yet. He went to the doctor today…over 17 pounds! It’s getting exhausting carrying him around! More moms are now beginning to notice the great benefits of the Baby Carrier.